Liverpool’s James Milner missed a penalty as his side wasted a chance to bolster their bid to qualify for the Champions League in an uninspiring 0-0 draw with Southampton on Sunday. With rivals Arsenal and Manchester United clashing in Sunday’s late kick-off, Jurgen Klopp’s team had a golden opportunity to seize the initiative in the race for a top-four finish. But the Reds never got out of first gear at Anfield in a terrible contest best remembered for Fraser Forster’s brilliant penalty save from Liverpool skipper Milner. It was Milner’s first missed penalty since November 2009, when he was playing for Aston Villa against Bolton, and it summed up the feeling that this would not be Liverpool’s day. Liverpool moved above Manchester City into third place, but they will hope fifth-placed United fail to close the gap with a win at Arsenal. Philippe Coutinho started despite suffering a dead leg against Watford last week yet he had little impact during a match where nobody in a red shirt stood out. Liverpool had failed to score against Southampton in their three previous encounters this season, once in the Premier League and in both legs of their League Cup semi-final tie, and the opening stages of this game contained very little attacking ambition from either side. In fact, this match furthered the idea that Liverpool struggle against Premier League sides of a lesser calibre, especially those teams that look to do little else but cling on for a point, as Southampton did for most of this match. In the opening 45 minutes, the home side had the lion’s share of possession but they did very little with it as Southampton sat deep and were more than happy to contain the likes of Divock Origi, Emre Can and Roberto Firmino. Firmino had the first real effort of note after 15 minutes, firing a shot straight at Maya Yoshida and Anfield soon became as stale and as flat as the contest itself. 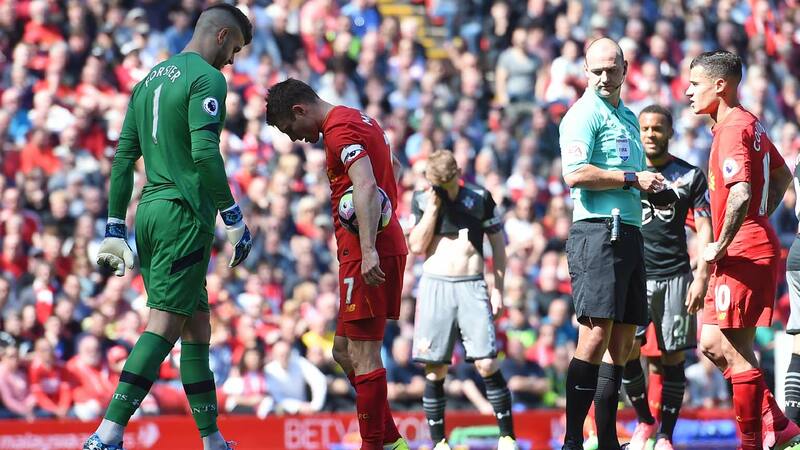 The match became increasingly fractious as Liverpool grew frustrated by their inability to break down the disciplined visitors. Immediately after the interval, Sofiane Boufal had the visitors’ first effort, dribbling through a packed six-yard box but his tame effort was easily smothered at the last second by Liverpool’s defence. The half-time break had done few favours for either side though as Liverpool remained dull and Southampton were more than happy to get nine men behind the ball and concentrate on defence at all costs. Firmino’s trickery could not unlock Southampton’s back-four while Origi and Coutinho remained virtually anonymous during an occasion when Liverpool really needed them at their best. Finally though, Liverpool got the opportunity they needed to punish Southampton as Jack Stephens elbowed away the ball inside the area after challenging Origi. It was well spotted by referee Bobby Madley and although Milner’s spot-kick was right in the corner, Forster did well to get down and palm the effort away. The passionate way Southampton’s players celebrated the fine save was also an indicator of how desperate they were to hold on for a point. Klopp brought Daniel Sturridge and Adam Lallana on with 20 minutes to go in a bid to give Liverpool a spark. But the Liverpool boss became increasingly restless and angry on the sideline. Sturridge could have lifted the mood when 12 yards out but he poked an effort straight at Forster. Lallana then had his own 20-yard effort saved by Forster with five minutes left before the Southampton keeper made another stunning save in stoppage-time, tipping over a Marko Grujic header to help the visitors hang on.